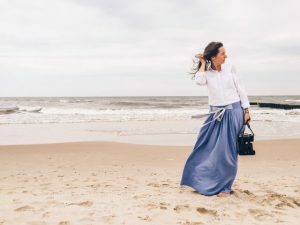 In summer is one of the favorite women garment, so how to combine long skirts of your wardrobe becomes an almost indispensable reading to face the summer season. With respect to the elongated silhouette that these skirts create with their verticality, I prefer them with long-sleeve top garments, especially with jackets, as in the cover image. Playing with materials, textures and light is the way to get a silhouette that has a long path to the eye, not boring. You can wear them even on a special occasion, an event, in which you can put on a structured jacket that contrasts with a long skirt made with a very fluid fabric. 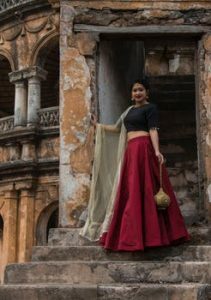 It is another advantage of such a long skirt in a fabric so light, used in a very long skirt and, in this case, with small folds, creates a lot of movement. Color, shape, texture, all enormously important things in a total look, but probably pay attention rarely to the “satellite” elements of the set, elements as important as the behavior of the garments. As it happens, when we move in a space, even more than the clothes we wear, what strikes us is the movement of those garments. A long skirt is the perfect garment to achieve that movement. 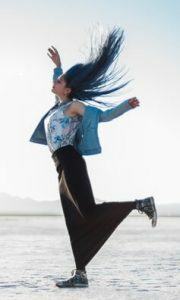 If you want the look to be perfect, the skirt should reach the ground, touching the feet, so that the skirt even covers them when walking and only see them “intermittently”. As for the upper part during the summer, choose narrow garments that draw the silhouette. It is dangerous to wear wide garments with a long skirt because, the only thing you will get is a total lack of definition of the silhouette, what I call the “sack effect”.. In summer they are perfect, use them to achieve a casual look with any type of body, even if you are pregnant, while you keep a fitted top and a skirt made with a fabric that is not very vaporous, that does not lift and stay very vertical, The total look will be fabulous. If the long skirt is made in a structured fabric, such as taffeta in this image, it is better to avoid folds and boards. Better bias cuts that make the fabric stay flat. Personally I do not like the effect created by very short tops, those that reveal a strip of waist. It is not a physical problem, I mean I do not like them even with a beautiful and harmonious body that has perfect abs. Here we enter the field of personal tastes and criteria, that is, I have no real aesthetic argument to defend this opinion, I would even say that it is possible that one day I will find some exception to this opinion, but in general it seems to me an effect vulgar that takes away the value of the look. Do I look rigid? It is possible, but that is my advice, do not show the gut and use long skirts that cover the feet. 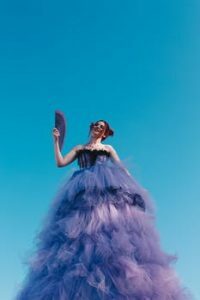 The tulle is very fashionable and, if the structure of the skirt is appropriate, for example in successive layers to the ground as is this image, the effect can be simply fantastic. Be careful only with the volume increase that can generate the tulle, especially if you have excess weight. 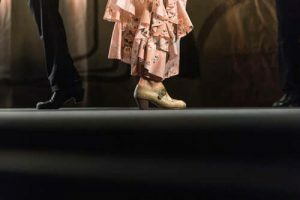 Let’s talk about footwear that, although it seems a minor issue, is of utmost importance if you choose to wear long skirts. Flee the heels, even if they are a few centimeters, will detract from both your image and the beauty of the skirt. If you’re used to wearing high heels and can not live without them, choose sandals with a platform, the thicker the platform, the better. The effect will be closer to that of a flat shoe, much better. You will also gain a few inches of height, which is not little, because a long skirt tends to reduce the feeling of a person’s total height. 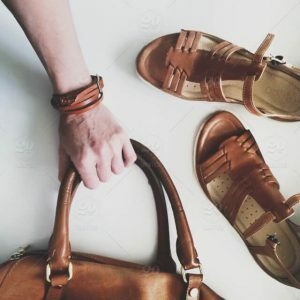 The perfect alternative is the boots, one of my favorite options that, moreover, are especially fashionable at this time, so you will find many alternatives at any price. They fit better with more structured skirts, long tube skirts in elastic fabrics and more consistent. Thick and aggressive in leather, black, short ankle maybe even motorcycle style with buckles and studs, fabric (I love the Converse) casual, formal or whatever you want, depending above all on the season, your style and of the occasion for which you want to use the attire. But in these summer days the simplest thing could be the best option and also the most accessible. For your look day or night, in the city or by the sea, you will only need simple and completely flat sandals, your long skirt, a narrow top and nothing else! Which coat should I wear with a long dress?